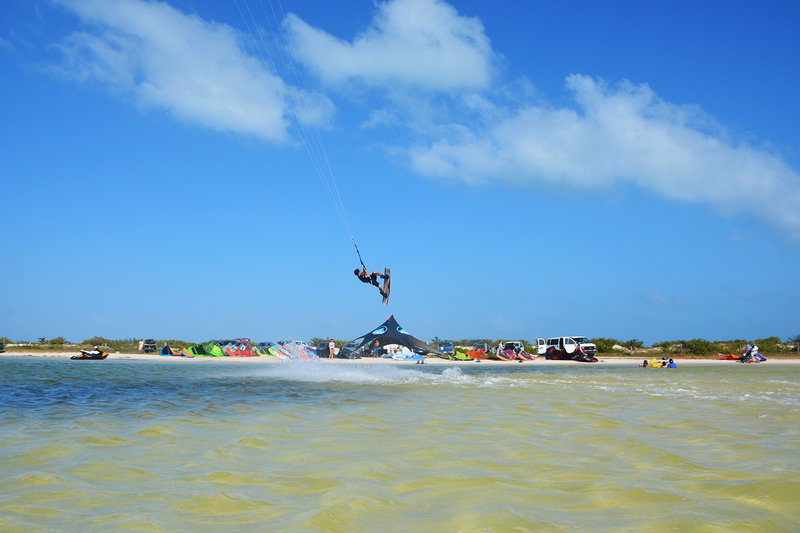 The main kiteboarding spot in Cancun is Isla Blanca, which is one of the dreamiest places you’ll ever visit. A 10-mile strip of protected land extends away from Cancun, with the ocean on one side and miles of waist-deep, butter flat water on the other. This, combined with white sand, consistent winds, turquoise water and the most incredible birds will take your breath away. If that isn’t enough to tempt you, who doesn’t love Mexican food?! The windy season is November to June. November to April is called “Temporada de Nortes” because the winds are affected by the north fronts coming from the US. The wind is strong (10-35knts) and cold but very consistent, a 4/3mm or 5/3mm wetsuit is recommended. As soon as the wind swings to East and South-East, which usually happens in April, you no longer need a wetsuit as the temperature increases dramatically. If you’re planning a holiday around April time, get in touch with a local school beforehand to find out if the winds have changed to the South yet. From April to May the wind averages 12-25knts. The easiest way to get around is by renting a car. You can find very cheap rentals in the area, either at the airport or the hotel zone. You can also take the bus’s around Cancun; they are cheap and easy to find, however, there are only 4 buses a day that go to Isla Blanca so if you don’t plan on renting a car it’s a lot easier to stay in Isla Blanca rather than Cancun centre or the Hotel Zone. Burritos, Tacos, Enchiladas… you won’t find any better than in Cancun. That, alongside the fresh fish will leave you craving for more. There are lots of restaurants to choose from in Cancun; in the town centre you will mainly find traditional Mexican food but in the hotel zone you can find anything from great sushi to Mediterranean food. If you are looking for food in Isla Blanca, there is also a restaurant at Ikarus kiteboarding that serves delicious fresh fish and Mexican food. On the drinks front, everyone should try some of the national drink, tequila! In Isla Blanca there’s no nightlife unless you organise a bonfire on the beach. However in the Cancun Hotel Zone you can party until the sun comes up every night if you want to. Most of the clubs have a 10-20$ entry free and once you get inside all drinks are included, so be prepared for your nights to get messy. There are a number of activities to do if the wind is not playing ball. You can SUP or kayak in Isla Blanca bay where you’ll be able to get very close to the wildlife such as pelicans, flamingos and flying fish. If you can get yourself out of bed for the sunrise it’ll be a magical experience. For those that want to escape from the beach for the day, there are beautiful sinkholes and caves with turquoise water called the Cenote. This is where the Mayans used to communicate with their gods. Check out the Lonely planet guide for more info: https://www.lonelyplanet.com/mexico/yucatan-peninsula/travel-tips-and-articles/secret-swims-the-cenotes-of-mexicos-yucatan-peninsula. If you are into diving, there is the second biggest coral reef in the world that you can go down to see or you can simply snorkel from the boat tours organised to Isla Mujeres and Isla Contoy. From May to August the whales and sharks pass by, so lots of boat trips are organised to go and see them. Another must see when you're in Cancun are the Mayan ruins. There are multiple places that you can go and visit however the most dramatic ones are in Tulum, 2 hours from Cancun, and if it’s windy you can even kite in front of them. The Wi-Fi in Isla Blanca is almost non-existent and the 3G only works in the occasional spot on the island. So if you need to stay connected you should head over to the Hotel Zone, where you are guaranteed fast and reliable Internet. 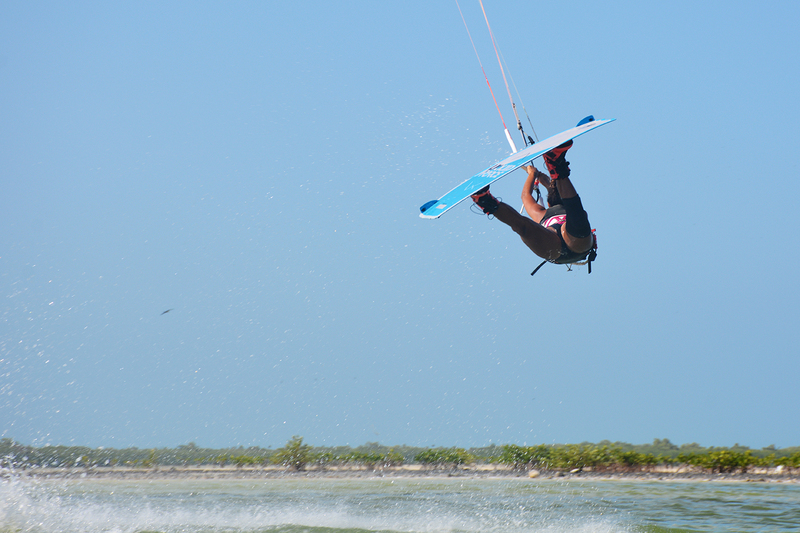 If you want to stay in the nature reserve of Isla Blanca, Ikarus Kiteboarding offers beachfront accommodation. It is clean and spacious with queen-sized beds and private bathrooms, which all have wonderful views. They power the accommodation with a solar system during the day and a gas generator for a few hours at night (just note that there is no Wi-Fi). There are also a few houses to rent in the area if you are coming as a group. If you want something a bit more modern, head over to the Hotel Zone where there is a vast array of hotels to choose from. The Hotel Zone is only a 20-minute drive from Isla Blanca, so it’s an easy commute if you want to kite every day and still be connected to the outside world with cocktails, cold beers and parties on tap too! Chris styling at Playa El Carmen. With three nationalities Rose doesn't really know where she’s from, however the one thing she is sure about is her endless passion for kiteboarding and craving for adventures. She rides for Slingshot & Mystic and is currently taking 6 months off from her city life in London to follow her dreams. She’s always looking for an adventure or a new spot to kite at so it’s a good thing that the world is so big as there are endless places to discover! Been to Cancun? What did you think? Where are the Best Kitesurfing Beaches in Cancun? Ikarus Kite Camp, in Isla Blanca, is a very popular spot when the north wind blows. Riders come from all along the coast to ride there as it is off-shore at most of the Riviera Maya beaches. The spot can get a bit choppy if the northerly wind is +25knts. When it’s north-easterly, the water is butter flat. If the wind is Easterly, it is better to go to La Punta, 5 minutes further along the Isla Blanca strip. Located in Isla Blanca, La Punta is one of the few spots in the area that works on every wind direction. East and south-easterly winds are off shore, so they give you butter flat water, ideal for beginners and freestyle. As the water is only waist deep there is no need to worry about the normal dangers of off-shore wind. This is one of the easiest spots in the world to learn to kite in as well as to improve your freestyle. Make sure you have some change when you go to la Punta as there is a 30 pesos ($1.5) parking fee; it is also recommended to watch where the locals drive not to get stuck in the sand. Punta Nizuc, in Cancun, works on an east/south-easterly wind direction. It has shade, parking, a small beach and shallow water which is quite flat but can get a little choppy in stronger winds. Be carful not to leave valuables in your car, as the parking is not always safe. This spot is located between Punta Cancun and Playa Delfines (el Mirador). It works best on north-easterly, east and south-easterly winds. This spot is only for advanced riders as there are a lot of sunbathers and the hotels cause wind shadows in some places. Make sure to watch out for the buoys that limit the swimming areas where kiters are not allowed. There is also a strong rip-current and there can be a violent beach-break so it can be hard to ride when the wind is onshore. When is the Best Time to go Kitesurfing in Cancun?